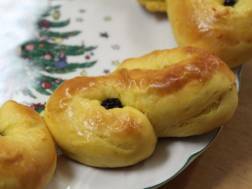 These buns, also known as lussekatter, are served every December 13th in Sweden in honor of St. Lucia. In the bowl of a stand mixer fitted with a paddle, mix together yeast, milk, saffron, and 1 tsp. sugar; let sit until foamy, about 10 minutes. Stir in the remaining sugar, along with the flour, salt, and 2 eggs. Mix on low speed until dough forms and gathers around the paddle. Replace paddle with dough hook and add butter. Knead on medium-high speed until dough pulls away from sides of bowl, about 8 minutes. Transfer dough to a large bowl greased with oil and cover. Let rest in a warm place until doubled in size, about 1 hour. Divide dough into 32 pieces and roll each piece into an 8"-long rope. Form each rope into an S shape and then roll each end into a tight spiral. Place shaped dough pieces 2" apart on baking sheets; cover and let rise in a warm place for 30 minutes. Uncover the dough pieces and place a couple raisins at the center of each of the spirals. Lightly beat remaining egg and brush each bun. Bake until buns are golden brown and cooked through, about 15 minutes. Transfer buns to a wire rack and let cool for at least 10 minutes before serving. These buns bring back fond memories of Sweden! If you don't have time to bake them yourself you can find them in the freezer at your local IKEA (Swedish Food Market near the exit).